This large jar was used to store dry goods, probably for use as medicines. The coat of arms would indicate that it was made for a particular family and so may have been intended for a pharmacy within the family's home. The style of decoration with applied masks in relief would date it to the latter part of the 14th century or into the early decades of the 15th century. The arms have tentively been identified as those of the Ottoni family who were based in Matelica in the Marche region of Italy. The Ottoni family has arms with a checky base in the shield but they are tinctured gules (red) and argent (white). It was not possible at this time to achieve a red colour and so the potter may have substituted yellow for the red parts of the checky base. 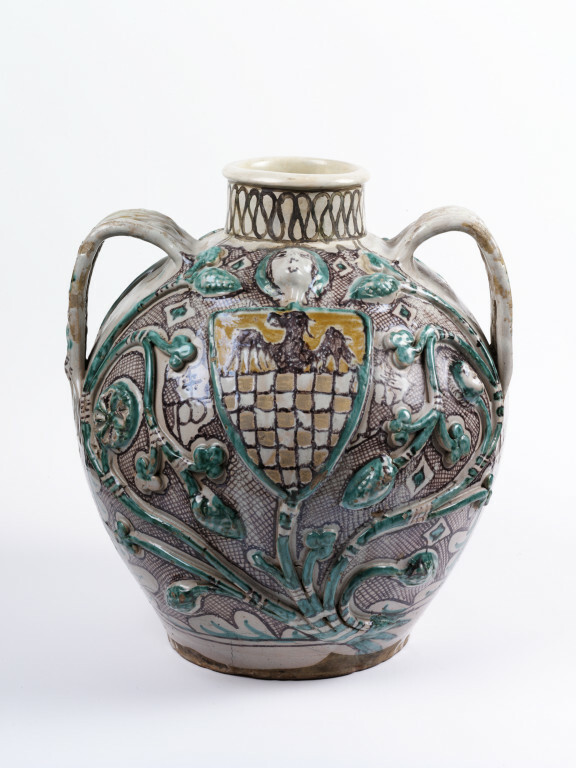 Jars with very similar decoration have been attributed to ceramic production centres in Orvieto, in the Umbrian region of Italy. Documentary evidence informs us that Orivieto was a production centre from the 13th century. Ceramic manufacture here began to decline in the latter part of the 14th century as it was badly affected by the ravages of the Black Death. In the late 19th and early 20th cetnries, the Italian government was investing in the redevelopment of towns such as Orivieto. A large number of medieval ceramics were discovered in the old water systems of the town such as in wells. Accurate dating of these ceramics was not possible but more recent excavations enable us to date these ceramics more precisely. Green and brown decoration seems to have been characteristic of Orivieto production from its beginnings in the middle of the 13th century and into the 15th century. This simple colour scheme is also found in Tuscany, Liguria, and other centres bordering on the western Mediterranean in France and in Spain. Availibility of colouring agents and the popularity of this colour scheme influenced its spread and longevity. Occurs four times on the jar. 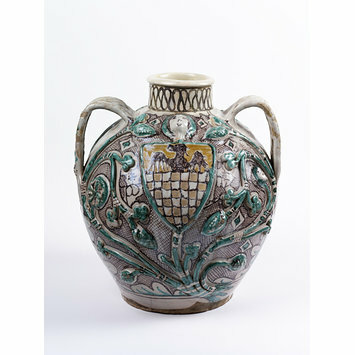 This jar was bought from the Castellani Collection of maiolica in 1884. La donazione Galeazzo Cora. Ceramiche dal medioevo al XIX secolo, Museo Internazionale delle ceramiche in Faenza, n.d.
Vase or jar, glazed earthenware, with globular body and broad grooved handles, decorated in relief with armorial shields, tendrils, masks, coloured green and manganese. This jar would have been used for display or in a pharmacy.